I'm loving these unseasonably mild days of late. It's December and I went out without a winter coat today. Love it! I've been popping into the City several days a week now that it's prime sample sale season. It's so much easier not to have to drag a bulky winter coat along - which will often get tossed on the floor while I shop. This look was centered around my new Rebecca Minkoff bag strap that I just picked up at the sample sale for $10. Isn't it funny how sometime you work a whole outfit around a single inexpensive accessory? The cape isn't the best fit - especially with a crossbody bag. I've always felt like it needed another button in front but for the $25 it cost me at the sample sale I can deal. And I always like to leave the house with a penny find so I mixed my spiked bracelet in with my Chanels. Honestly, it's really all about being in the right place at the right time. The more you shop, the more likely you are to find. Bag Strap: Rebecca Minkoff, sample sale, $10 - see other scores here! 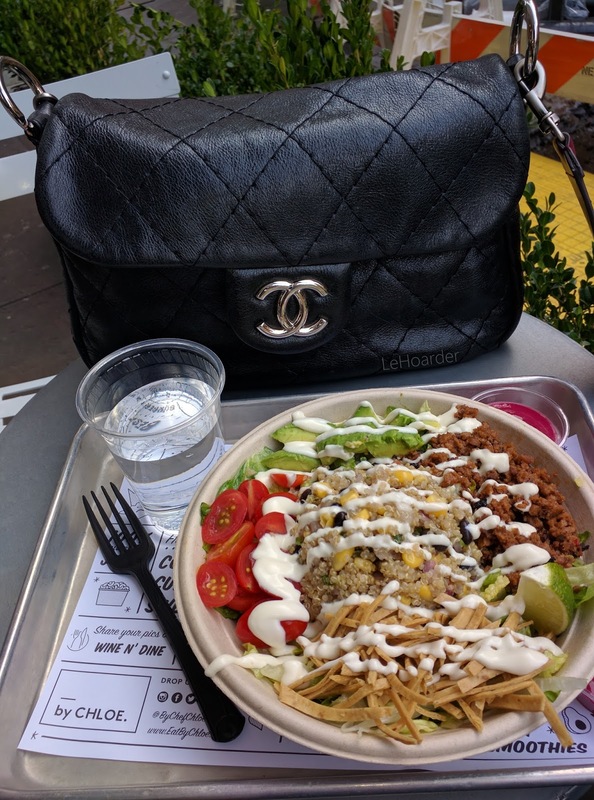 Bag: Chanel, Neiman Marcus, 75% off - read about it here. Photos are by Belle of LittleFashionStylist - thanks doll! We met for lunch at byChloe (again!) and once again I had my go-to quinoa taco salad. It's sooooo good. It has this agave lime dressing that just pulls it all together. A good dressing makes or breaks a salad and theirs is spot on! The first time I told Belle to meet me at byChloe she thought I meant to meet me by the Chloe (designer) store. It's my fault because it didn't occur to me that she didn't know what I was talking about LOL. It's one of those places that once you know about it, you just don't understand why everyone else doesn't know yet. They have a few locations in NY and LA - so if you're into Kosher or Vegan, I highly recommend! I know! I need more chicken/fish protein in my diet. Thanks! I felt like I practically stole it LOL. And you gotta get to byChloe - they keep opening more locations too! I love the Chanel spike cuffs! Such a nice idea to dress up your look. Thanks - the spiked cuff is actually not Chanel - the other two with pearls and diamonds are. But they mix together really well, right? You're my new best NY thrifty blogger friend! Thank you for sharing all your thrifty finds and not hoarding all the info for yourself. I LOVE that RM strap. Pairs so well with the Chanel!! Aww thanks so much! I always overshare LOL and there are enough deals to go around! I love everything with quinoa. and that good looks amazing and thanks for sharing thrifty finds. I cant wait to visit NYC soon, I have never been. Me too! I've been obsessed with quinoa since I discovered it. And yes -come to NYC! Seriously, there's no where in the world like it! chanel bags are always classic :) nice outfit! I totally agree! Thanks Samantha! Haha I totally agree Charissa! I love your outfit from head to toe! You always look so cool and chic. That is such a fab Chanel bag and I love that awesome strap! babe this bag is so cute!! It's not vintage - I purchased it brand new at Neiman Marcus a couple years back. It was a seasonal bag which is why it didn't have a chain strap. OMG those are fries are so goooood! The Rebecca Minkoff strap adds a nice fun touch to the chanel bag and make an ordinary bag look unique. That's so cute that you're thinking outside the box... something I'll definitely consider more when I put my outfit together next time.